Home Dresses	Wiggly Peplum Dress! What comes first– the pattern or the fabric? It’s an age-old question, really (no, it’s not)! Me, I go to Mood Fabrics in NYC armed with a plan and a pattern every month, with a pretty decent idea of what I’m looking for, but I’m invariably assaulted by a beautiful fabric of a completely different variety and end up leaving with her! It’s a pretty good bet that if I come in looking for gold brocade, I’m probably going to leave with fuchsia voile. This fabric was no exception! I had completely different plans for this month’s project, but when I saw this Nanette Lepore neon-green, cotton-blend houndstooth, what was I supposed to do? Leave the gal behind? No way, Jose! The drawback to buying fabric on a whim is that it often takes me a while to decide what I want to make! I had my heart set on a little romper or two-piece playsuit, but finally talked myself out of that when I realized it would literally NEVER step outside my closet. So then I settled on By Hand London’s Charlotte skirt for its suuuuper wiggle-a-bility. But then I thought about how much fabric I would have left over, so I decided to make a peplum top, too! Fun, right? Only, I dug through my notions and I only had a 22″ zipper that matched, and that was enough rationale for me to make a dress instead of separates. This seems RIDICULOUS now that I think about it, but let’s move on. So, I opted for the Charlotte skirt bottom, with the ruffle, and the bodice from Vogue V8511 (OOP), which I’ve made once before, which is KIND of like a skirt with a peplum top. This became one of those projects where I couldn’t stop tinkering with it! I fitted the skirt like a glove and felt super hot until I figured out that I couldn’t sit down in it! Whooooooops! Obviously I should have realized that if I wanted a REALLY wiggly skirt, I should’ve followed BHL’s recommendations and used a fabric with stretch. I have to say that it took two days of contemplation before I let out the seams! I kept thinking through scenarios in which I could wear this dress and not have to sit or climb stairs (cocktail party!). But these scenarios all ended in my mind with me toddling around on heels, trying to get into a cab at the end of the night without sitting down– disaster! So the seam ripper was the only way to go! But then I felt TOO frumpy, so I took it in a bit more between the hips and the waist. But then I STILL felt frumpy, so I took it in from mid-thigh to hem, leaving the extra room I needed in the seat area intact. THEN I fidgeted with the length, pressing up and down different hem lengths. Crazy! The dress is fully lined with rayon bemberg, which feels awesome! I hemmed it with rayon seam binding, which was really fun to use. 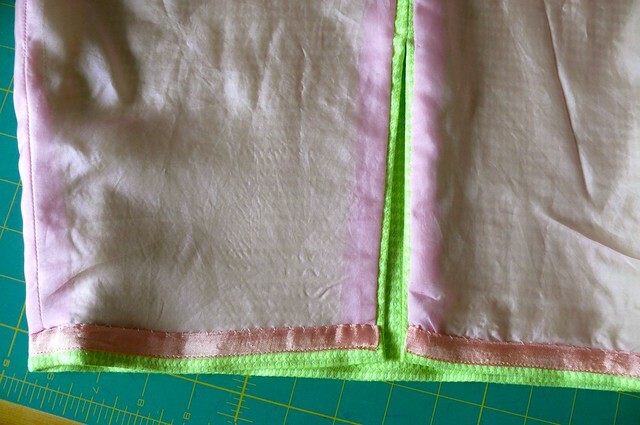 I love the pink paired with neon green– it makes me feel like a secret watermelon (that sounds weird, doesn’t it?). It’s not very subtle, but then again there’s nothing subtle about this dress! I laughed because when my mother-in-law saw this dress, she remarked that it looked like a dress one of her Barbies had in the ’60’s (only her dress was a classic white). I do feel a bit like a Barbie doll or something in this dress– it’s not a very serious outfit. But it’s fun to wear. 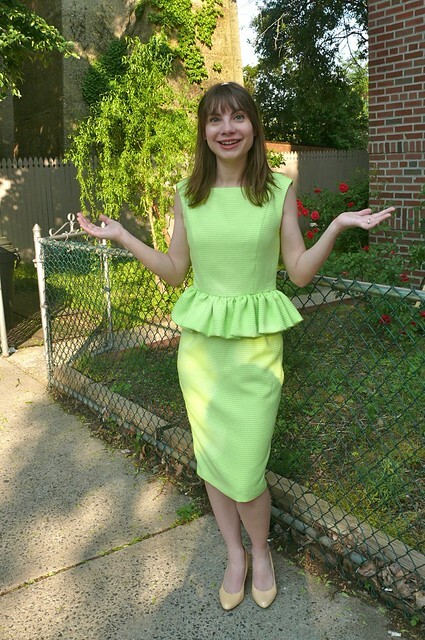 If I made this again, or just the skirt, I would take some of the volume out of the peplum and lengthen it so it hits a little lower on the hips to sort of fake an hourglass figure more. As it is, it makes me feel kind of thick around the waist, which isn’t really the goal. But I love this fabric so much! It’s unusual and really fun to wear. Now I want to know– when you’re sewing, do you choose the pattern first, or the fabric? Are you seduced into impulse purchases, or do you stick to your plan in the fabric store? Be honest! Editor’s note: I just checked, and we still have some of this Nanette Lepore cotton at Mood NYC and possibly at Mood LA as well. $18/yd. Contact the stores to order: NYC 212-730-5003; LA 323-653-6663.